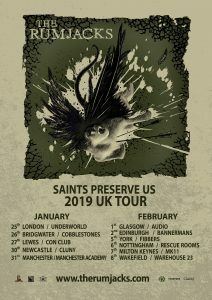 after a well earned break enjoying the festive season we are back on the road, touring our latest release “Saints Preserve Us” across the UK. We’ll be tearing up some of our favorite haunts across the country again, as well as hitting a few new cities over 11 nights. It all begins tonight at The Dome, Tufnell Park, come and join us and chase those winter blues away. ← 2018- A Year in Review.